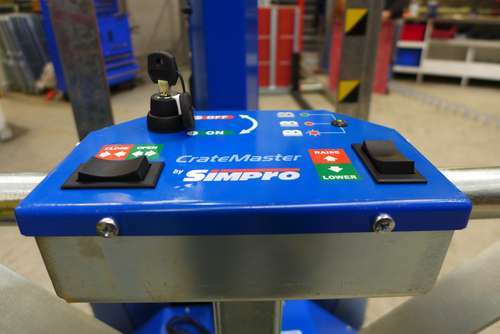 Push the Crate lifter in until the crates are located right into the corners of the upright guide plates. Use the RIGHT rocker switch to RAISE and LOWER the arms. When the arms are at the correct height, use the LEFT rocker switch to close the arms onto the crate that you wish to pick up. Note: the Crate Wizard can also lift stacks of empty crates where alternate crates are stacked upside-down and at right angles. An in-line flow control valve provides fine adjustment of the lowering speed. Remove the left-hand cover, and turn the outer sleeve anti-clockwise (viewed from above) to reduce the speed.